Annual tribute show celebrated the life and music of "Dimebag" Darrell. Stone Sour Share Official Video for Acoustic Version of "Mercy"
Stone Sour Share Official Video for "Knievel Has Landed"
'Hydrograd' Deluxe Edition, featuring unreleased covers, b-sides and more, is due out August 31. Stone Sour Premiere Cover of Metallica's "Creeping Death"
Stone Sour have premiered their cover of Metallica's "Creeping Death." Check it out below and let us know what you think in the comments or on Facebook. Video Finds: Corey Taylor of Slipknot Goes Acoustic for Black Sabbath's "Paranoid"
Stone Sour have released their latest music video in support of their double-album House of Gold & Bones – Part 1 and 2. 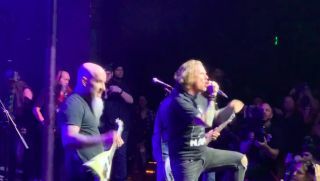 2013 Golden Gods Video: Stone Sour Play Black Sabbath's "Children of the Grave"
The Grammy-nominated Stone Sour recently announced details of their headlining slot of the first-ever Revolver “Road to the Golden Gods” Tour presented by Epiphone and Drum Workshop. Stone Sour Streaming Two New Songs, "Gone Sovereign/Absolute Zero"
Earlier today, Stone Sour posted two tracks from their upcoming new album to YouTube. You can stream "Gone Sovereign/Absolute Zero" below. Stone Sour Offering Fans Clip of "Absolute Zero"
Stone Sour are now streaming a clip of a new song, "Absolute Zero," on their official website in exchange for a Facebook or Twitter share. List here. Stone Sour fans got a special gift recently when the band released a new live DVD -- Live At Brighton -- to anyone who subscribes to their Dead Generation fan club via Stonesour.com. Stone Sour frontman Corey Taylor took to Twitter yesterday to clue fans in on the details surrounding the upcoming new album from Stone Sour — or as it turns out, albums. The 2012 Revolver Golden Gods took place last night, putting together a night of epic performances like no other show can. Stone Sour frontman Corey Taylor revealed yesterday via Twitter than the band had just started work on a new studio album. Slipknot/Stone Sour frontman Corey Taylor has revealed via Twitter that he recently recorded a new song with Foo Fighters mainman Dave Grohl and producer Butch Vig. If you weren't able to make it all the way down to Rio de Janeiro over the weekend, you can now check out pro-shot footage of Stone Sour's Rock In Rio performance below.